In the World Cup quarter-final at the same ground last year, Martin Guptill had clanged the stadium roof with one of the 11 sixes he hit in his 237. On the eve of this match, Guptill remarked to Ross Taylor that no one had done this twice. It didn't take him long to pull off this feat. Last ball of the first over, he went down on one knee to Anwar Ali and launched him high over midwicket, not even looking at the ball as it clattered into its target. By then, he had already hit two fours, and become the second player to reach the double of 150 fours and 50 sixes in T20Is. 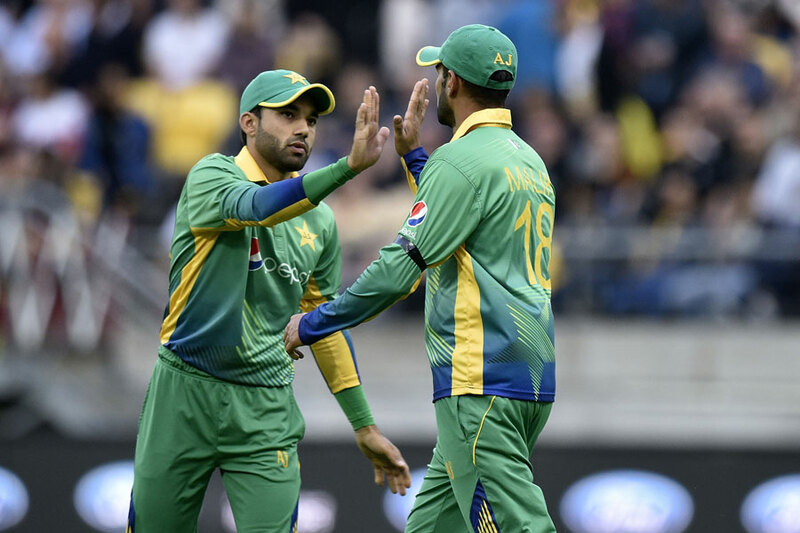 Guptill was hitting the ball to all parts, and Umar Akmal, fielding in the deep, had overrun the ball on one occasion when he slog-swept Imad Wasim to cow corner. Now, in the sixth over of New Zealand's innings, Guptill miscued a similar shot off Shahid Afridi. The ball hung high over the midwicket region as Akmal ran in from long-on. His catching technique looked questionable, with his hands cupped over his shoulder and his eyes not on the ball as the ball dropped down, but he managed to hold on comfortably enough. Five balls after Guptill's dismissal, Kane Williamson flicked a full-toss, and Colin Munro set off from the non-striker's end even though the ball had gone straight to Mohammad Rizwan at midwicket. Munro had not gone too far out of his crease, so Rizwan, crouching to pick up the ball, needed to react quickly. This he did, letting loose a flat, powerful throw while still on his haunches. It was a pinpoint accurate throw too, and it needed to be - he only had one stump to aim at, and the bowler was nowhere near the stumps. Batting at No. 3, Rizwan looked a bundle of nerves. He chopped the second ball he faced straight to Mitchell Santner at backward point, and set off for a single. Santner's throw missed the stumps, and Rizwan, turning around quickly, would probably have made his ground anyway. But the nerves had not gone anywhere. In the next over, Corey Anderson got one to bend into him and strike his front pad. Even as the umpire turned down the lbw appeal, with the ball reckoned to be pitching outside leg stump, Rizwan ran out of his crease as the ball ricocheted into the off side. This time, he had run too far out of his crease to be able to turn and make his ground, and Santner, swooping over the ball once again, declined to throw, deciding instead to sprint to the stumps and flick the bails off.